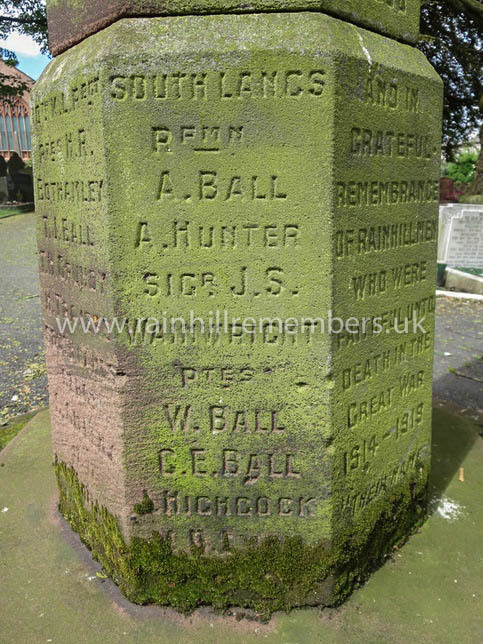 Like several other soldiers featured in our case histories, Arthur Hunter would appear to have no link to Rainhill, yet his name appears on both the Brass Plaque in St. Ann's Church and on the WW1 Memorial in St. Ann's Churchyard. Sadly we know little about him except that his parents Joseph & Sara Jane Hunter lived at 20, Hulton Avenue, Whiston (it may be that at some point they moved to Rainhill, hence the connection). There is an 'A. Hunter' remembered on the WW1 Memorial in the grounds of St. Nicholas' Church, Whiston which may well be the same man. Arthur enlisted as Rifleman 4295 in the South Lancashire Regiment and died on 10th, August 1918 age 33 and is commemorated on the Thiepval Memorial. At a special ceremony at the Warrington Road Cenotaph on Sunday 3rd July 2016, Rainhill village dedicated a new plaque bearing the names of 17 men with Rainhill connections who perished during WW1. These men's histories were found during Rainhill Civic Society's research. Rainhill Parish Council funded the plaque and organised the ceremony with Rainhill Civic Society, our local Churches and the Royal British Legion. Arthur Hunter is one of those names. Arthur Hunter, of the South Lancashire Regiment is remembered on the WWI Memorial in St. Ann's Churchyard, Rainhill.